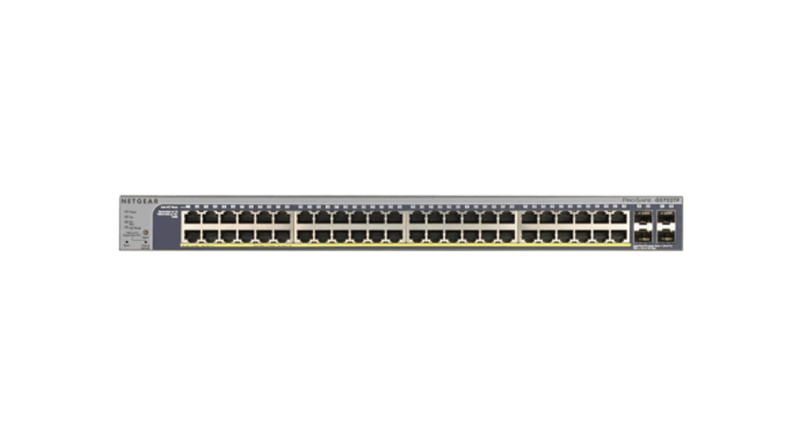 Ports - 48 10/100/1000 Mbps auto-sensing Gigabit-Ethernet switching ports, and four dedicated 1000M SFP fiber ports. An ideal companion to the rapidly emerging class of 10-gigabit servers, the NETGEAR® ProSafe® 52-port Gigabit Stackable Smart Switch is the industry's first smart switch with 10-gigabit connectivity - delivering maximum throughput in SMB networks for demanding tasks such as data replication and backup, virtualization, video on demand and high-volume transaction processing. At less than half the cost of a managed switch, the ProSafe 52-Port Gigabit Smart Switch provides 48 gigabit ports for connecting devices to the network, along with four 10GE SFP+ ports for stacking or uplink to servers. As many as six switches can be stacked for a total of 288 network ports, with full redundancy for unsurpassed reliability. The GS752TXS offers a rich enterprise-class feature set, including advanced traffic management and security, yet can be easily configured and monitored through a web-based graphical user interface.